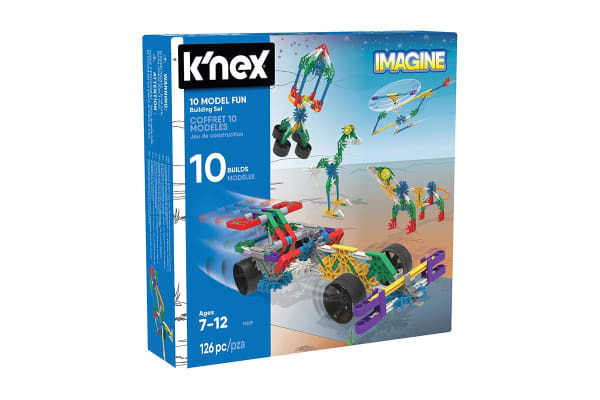 Encourage your children’s creativity and imagination with the highly stimulating K’NEX 10 Model Fun Building Set! Complete with 126 classic K’NEX pieces, this building toy gives children an outlet to learn and enjoy. The K’Nex 10 Model Fun Building Set is composed of colourful plastic rods and connectors that snap together with a simple click. These pieces can be combined together to create real working vehicles, moving structures and just about anything your child can imagine. In the process, this educational engineering toy will put your child on a path towards a better understanding of STEAM (science, technology, engineer, arts and math) subjects. The K’NEX 10 Model Building Fun Set also fosters kid’s growth by strengthening hand-eye coordination, fine motor skills, problem-solving skills and spatial awareness.